UNITED NATIONS, January 13 -- After the UN was unable to send helicopters from Juba in South Sudan as 6000 fighters descended on Pibor, UN Peacekeeping chief Herve Ladsous told the press that "dozens" had been killed there. After the Commissioner of Pibor County put the number of dead civilians at over 3000, the UN said that it would not make its own count of the dead, but rather focus on its belated humanitarian response. On January 13, two days after Inner City Press exposed the reason for the UN's slow response -- that since mid November when the Russian helicopter pilots previously under UN contract in North Sudan told the UN Department of Field Support that they would not fly -- Secretary General Ban Ki-moon's Deputy Spokesman Eduardo Del Buey told Inner City Press that now the UN says that it found only fifteen bodies in and around Pibor town, and no witnesses to more. "The UN's cover up is complete," a whistleblowing UN official nearly immediately told Inner City Press. "For now." 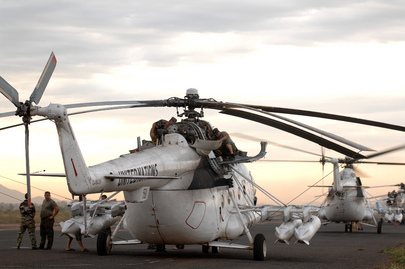 On January 12, after Inner City Press published its first story on what more than one Security Council members called DFS' and the UNMISS mission's "negligence" in continuing to reply on the Russian helicopter they had been told would not fly, Inner City Press asked Ban's main spokesman Martin Nesirky to explain how these UN actions were reasonable. Spokesperson: I agree, it is a very serious matter. Inner City Press: So just the letters of assist; I wanted to say what the Russians say and I want to get your response to it, because otherwise I just have what they say. They say when they agreed to provide the helicopters they’ve never, we’re going to have machine guns on them, and, therefore, that it is not just a matter of a letter of assist not being signed, that there is a substantive change in what they were being asked to do and they made it clear to DFS that until this was approved in Moscow, they would not fly. And therefore, according to them, DFS knew for since 1 December or at least the 15th until this incident took place in January that they had no helicopters and that’s what, I just, I don’t want to put too fine a point on it, but helicopters may fly in other instances after a signature, but in this case they were told it is too big a change, we won’t fly. And I wanted to know, what did DFS do when they knew that they had no helicopters? Spokesperson: Well, Matthew, couple of things: one is that, while negotiations are going on, as I have just said, we don’t comment on negotiations between Member States and the Secretariat. I would simply say that there is more to this, and I think that you will be able to learn more about that. Inner City Press understood this last comment, that "there is more to this, and I think that you will be able to learn more about that," to mean that either the Department of Field Support or UNMISS, whose chief Inner City Press has in the past e-mailed only to be referred back to Ladsous' office in New York, would be providing the UN's explanation for it mis-reliance on the Russian helicopters from mid-November until the deaths, at least some of them seemingly preventable, in Pibor. But a full 24 hours went by with no word from DFS or UNMISS. So at Friday's noon briefing, with Nesirky traveling with Ban in Lebanon, Inner City Press asked Deputy Eduardo Del Buey when the projected explanation would arrive. Del Buey focused on another part of what Nesirky said, that the UN doesn't comment on ongoing negotiations with member states. Inner City Press began to ask a factual question about the UN's belated bringing in of Bangladeshi helicopters from MONUSCO in the DR Congo, but Del Buey ignored the question, trying to solicit other questions from other correspondents. When Inner City Press followed up, Del Buey asked, "Did you speak with DPKO?" Inner City Press has nearly given up trying to get DPKO chief Herve Ladsous to do what his predecessors did: answer questions from the media at least on the way in and out of Security Council meeting such as the one he attended on January 12. But Ms. Malcorra had said she would talk - and has yet to. Del Buey would not say when, but when Pressed about the UN's own count of the dead in Pibor can out with the "fifteen bodies" number, contradicting not only the Commission of Pibor County's 3000 figure, but Associated Press' figure of "hundreds if not thousands." And soon after Del Buey ended the wan briefing, a whistleblowing UN official told Inner City Press, "The cover up is complete....for now." Watch this site. Footnotes: in other questions Del Buey did not answer at Friday's noon briefing, when Inner City Press asked about religious officials in the DRC demanding that the electoral officials there admit their errors or resign, Del Buey said that Nesirky "has explained MONUSCO's position and it remains the same." And what is MONUSCO's position on the legislative elections and what it called "lessons learned, for the future"? Inner City Press asked if Roed Larsen attended Ban's meetings in Lebanon and Del Buey wouldn't say. Inner City Press asked if Ban's five years in one position policy applies to the head of the Department of Management Angela Kane -- who Inner City Press has already reported may be headed to the Disarmament post in a form of musical chairs -- and Del Buey said "it applies," but declined to confirm anything else. 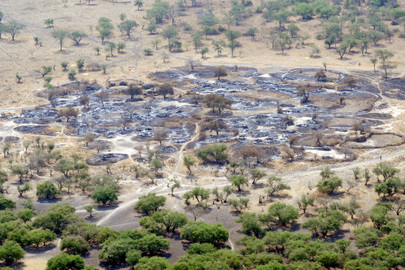 Most troubling, however, was the UN's self serving minimization of the Pibor dead to fifteen. Watch this site.